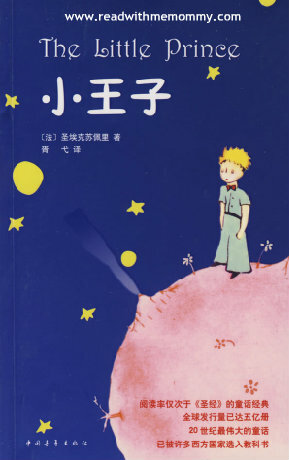 The Little Prince is an timeless classic, originally written (in French) and illustrated by Antoine de Saint-Exupery. First published in 1943, this book is touted as one of the most read and most translated book in French language. This is the Chinese translated version. As a young boy, the narrator once drew a picture of a boa constrictor with an elephant digesting in its stomach. Every adult who saw the picture would mistakenly interpret it as a drawing of a hat. Whenever the narrator try to correct this confusion, he was ultimately advised to set aside drawing and take up a more practical or mature hobby. The narrator laments upon adults' lack of creative understanding. Now, as an adult himself, the narrator has become a pilot, and, one day, his plane crashes in the Sahara desert. Here, the narrator is suddenly greeted by a young boy whom he calls "the little prince". Over the course of eight days stranded in the desert, the narrator gets to know the little prince better, as the latter shares with him his love for a vain rose, and his encounters with different characters at each of the other 6 asteroids - the king with no subjects, a conceited man who thinks himself as the most admirable person in an uninhabited planet, a drunkard who drink to forget the shame of being a drunkard, a lamplighter who extinguished and relighted a lamp every single minute, without much thought. Finally the Little Prince visited the Earth. Read the book to find out what happen next.